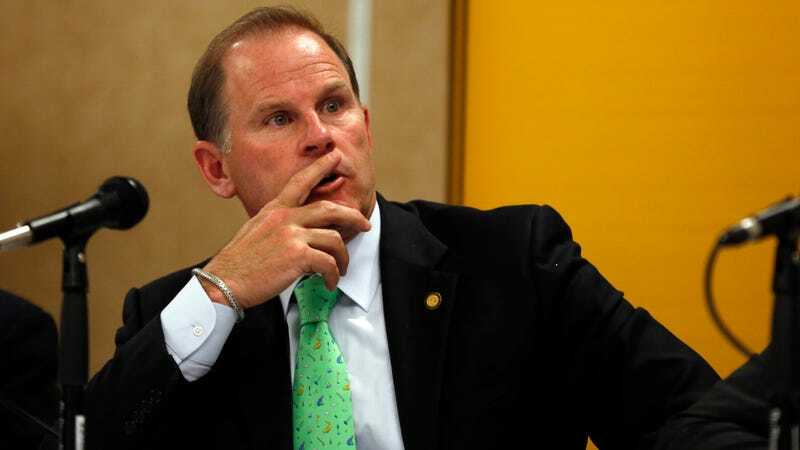 The University of Missouri’s system president Tim Wolfe is resigning after recent student protests over his failure to address racism on campus. A Change.org petition—which has over 7,000 signatures—called for the removal of Wolfe as president, and members of the school’s football team joined in on the protests by refusing to play. (A black student also went on a hunger strike). It is clear to all of us that change is needed, and we appreciate the thoughtfulness and passion which have gone into the sharing of concerns. My administration has been meeting around the clock and has been doing a tremendous amount of reflection on how to address these complex matters. Clearly, we are open to listening to all sides, and are confident that we can come together to improve the student experience on our campuses. We want to find the best way to get everyone around the table and create the safe space for a meaningful conversation that promotes change. We will share next steps as soon as they are confirmed. In conjunction with campus representatives, the university began work on a systemwide diversity and inclusion strategy, plan and metrics for the University of Missouri System as part of my strategic goals (see 1.4.i of the System Strategic Plan) as approved by the Board of Curators in summer 2015.